Fig. 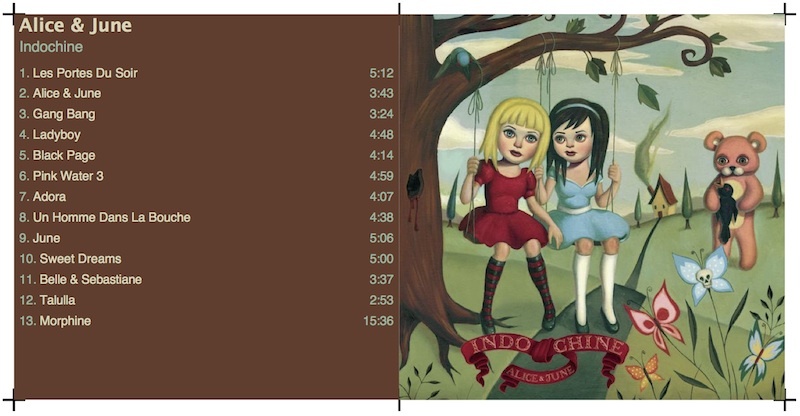 1 - Double cover creation from a selected album in iTunes. 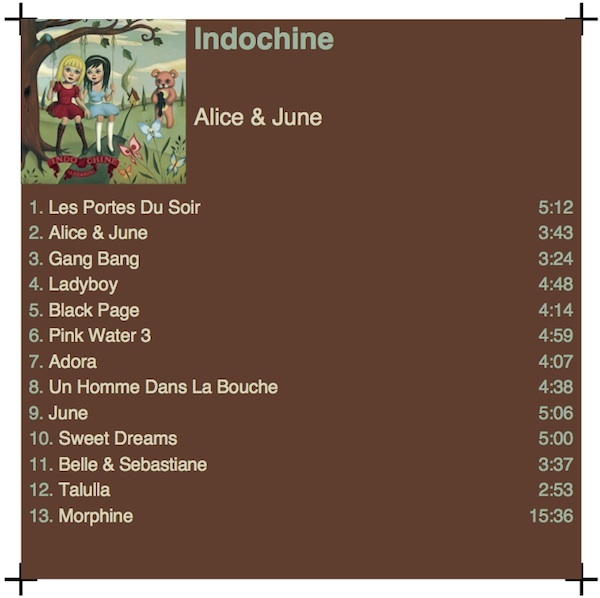 MyCoverCD is a Cocoa application for cover cd creation, either with a playlist, an album or differents selected tracks in iTunes. This application is only for Mac, tested with iTunes 10 (and higher) and requires Mac OS X 10.7 or 10.8. MyCoverCD will be available from Apple AppStore (submission done). A demo version is available. This demo is limited by code, see menu item "MyCoverCD/Registration...". 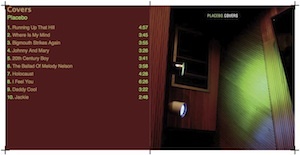 Some cover examples built by default from MyCoverCD. 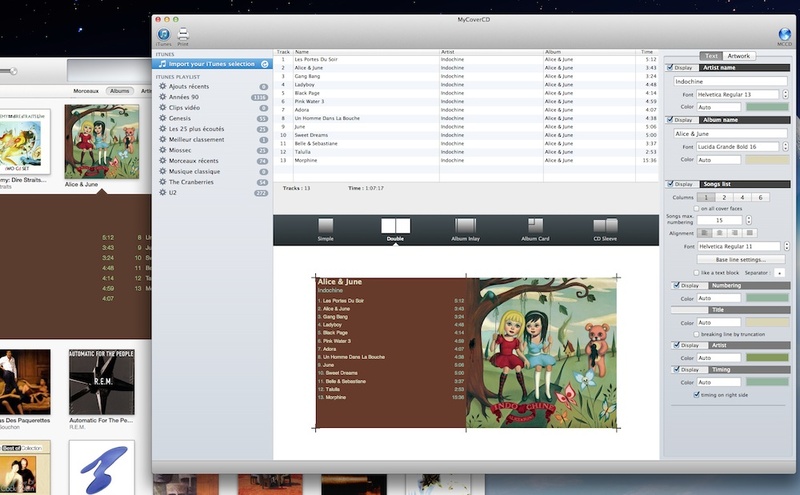 MyCoverCD uses iTunes artworks and informations to create CD insert. 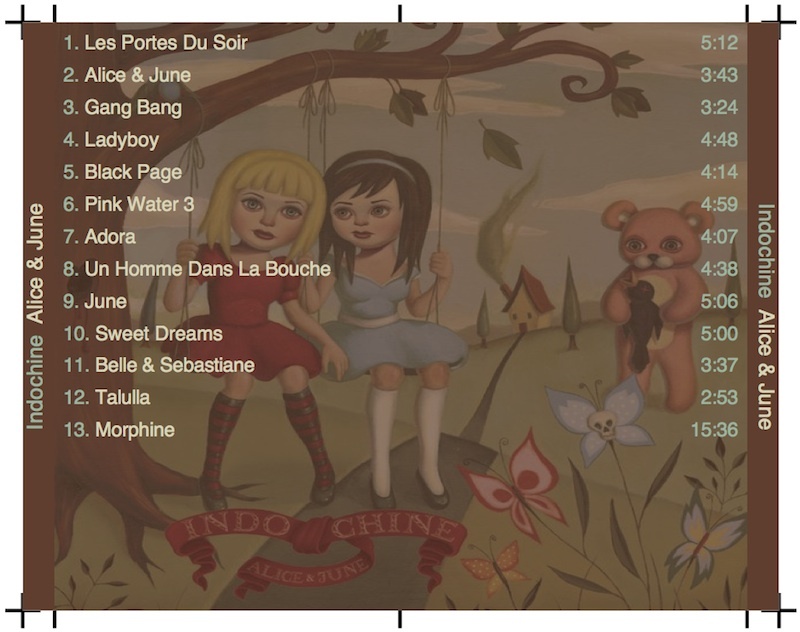 The iTunes selection can be either differents tracks, an album, an artist... The cover is done with your iTunes choices. Cd insertion is automatically detected by MyCoverCD. 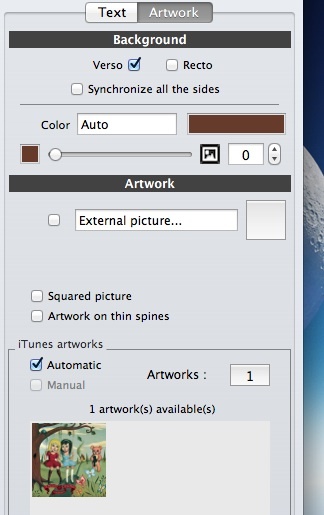 Itunes selection can be reloaded from reload button. All templates are available in the custom template toolbar. You click and the template is done. 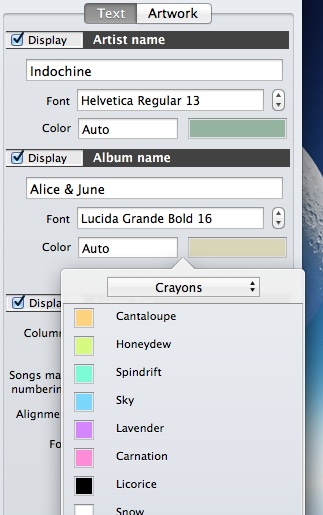 With iTunes artwork or external image, MyCoverCD does automatically color study to fix text items and background colors. No sign on covers. Cover printing is done on normal paper. 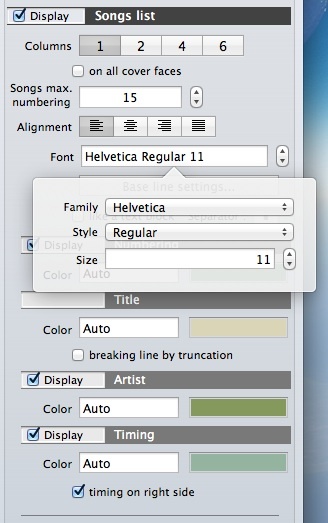 From MyCoverCD user interface, you can change the font, his size, his color, the paragraph alignment, the text spacing. The text can be done on multi columns or telegraphic form. Some text items can be hidden, like track numbering or time lenght. All the text can be hidden if you want with the check box. 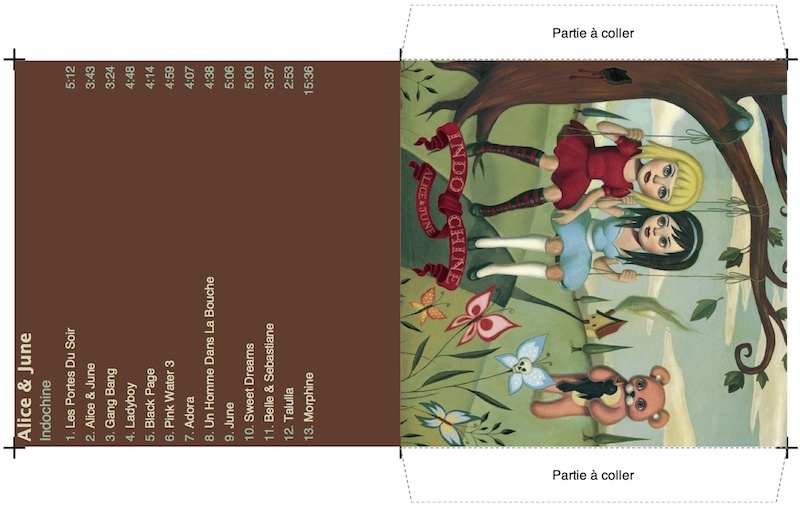 The customizing is done from MyCoverCD user interface. You can change the font, the size, the color. Each item can be individually hidden with the check box. Artist and album names are listed on thin spines. This text is customizable like others : font, size and color. 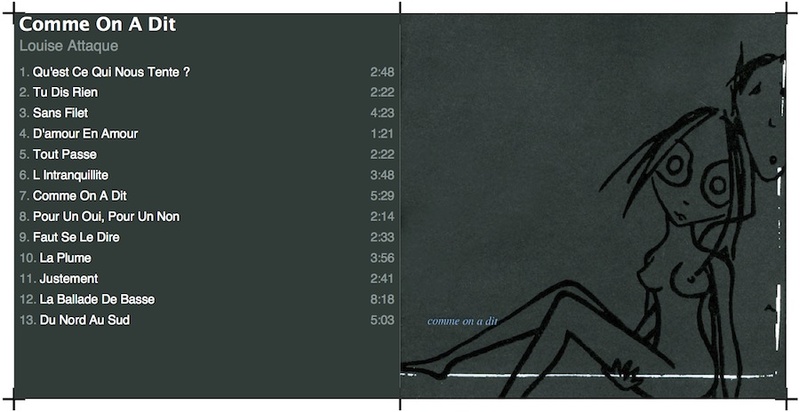 MyCoverCD can do a mosaic with one or several artworks. 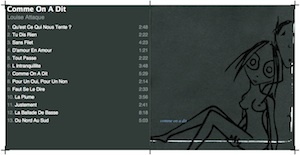 MyCoverCD handles until 16 illustrations and by default does a mosaic if several artworks are found in iTunes. MyCoverCD can set the picture opacity value and background color for drawing personal illustrations. A demo version is available but limited. MyCoverCD is now available in Mac AppStore. 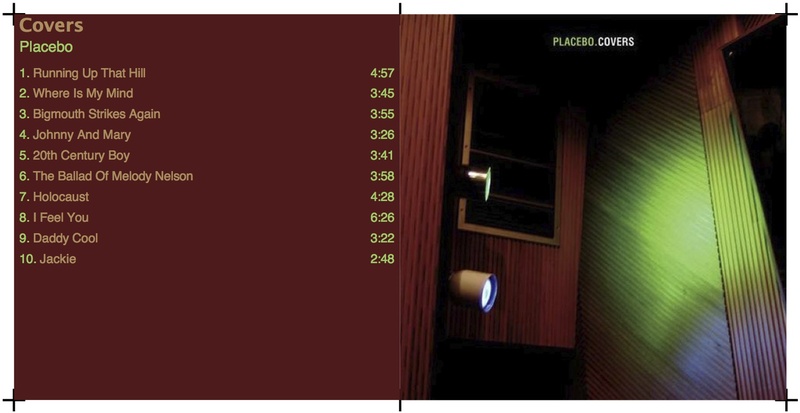 What are the dimensions of the CD covers ? The front cover is squared, 120 x 120 mm. 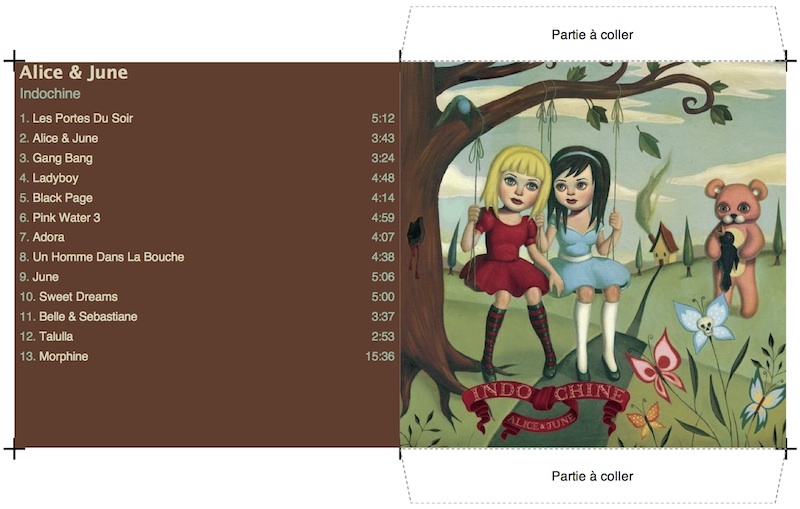 So, if you don't want that Cocoa resizes the illustrations, provide a squared illustration (for example 500 x 500 pixels). 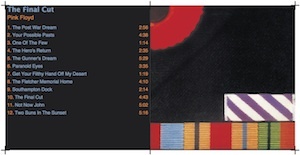 Will MyCoverCD support special papers planned to print covers cd ? The answer is no. Why ? Personally, I don't use special paper, I print on normal paper hard-back, then I cut up the covers with a cutter, like this I'm sure that the covers are good printed . Then no, I won't implement this possibility in MyCoverCD, sorry. Les marques ou logos cités appartiennent à leurs propriétaires respectifs. Page valide XHTML 1 Strict et CSS1. Site trad.applescript V 2.0 © nicolas Descombes 2004 - Fait par ma pomme (moi).